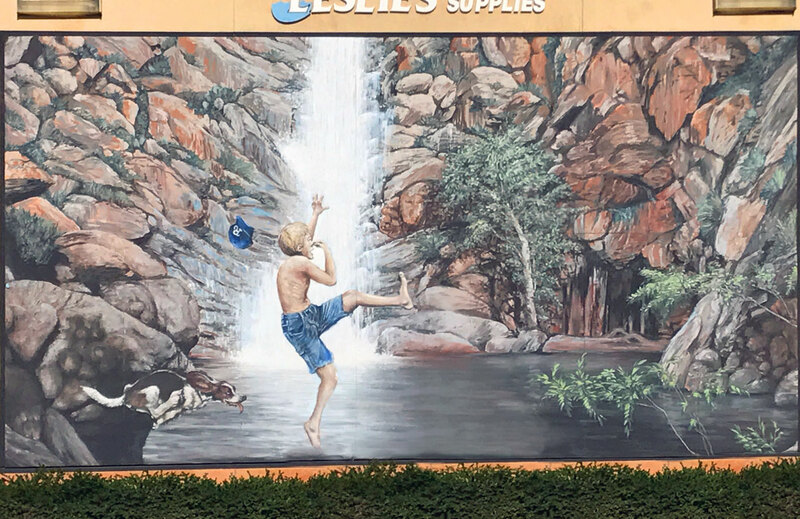 The mural is located at the Leslie’s Pool & Spa building, 1905 Main Street Ramona – this is the second mural to be located outside the “old town” area of Ramona. It depicts a snapshot of an experience most of us will recall from their youth, whether they grew up in Ramona or not – “The Old Swimming Hole”. The artist is Thom Guerra. Thom Guerra was 13 years old when he started to learn the sign painting trade after his mom. From that, when customers asked if he could add other subjects, his repertoire gradually expanded into mural painting. And now, with over 30 years of experience he has painted murals throughout Southern California, including the prestigious Olaf Wieghorst Museum in El Cajon.